It was a fair day; moderate wind, immensely sunny. Definitely not the kind of day when your life does a total one-eighty on you. When I had gotten up I had watched the sun rise as I heated up the rusting stove for breakfast. The smell of frying bacon must've attracted my three neopets, and they came to the kitchen like wildfire. After enduring a chorus of "When's breakfast ready? ", dropping a ceramic plate on my foot, successfully setting the table, and nearly choking on my eggs, breakfast was finished. I left Rokkelle, a cloud Kiko, to do the dishes and went about my household chores. Once they were completed, I was attacked by my neopets- who wanted to go shopping. Stocks hadn’t been well lately, but I had promised them four months ago we would go on a shopping trip... time really flies. After a “Be ready in six minutes”, I was stuffing make-up and neopoints into my purse. On the boat ride to Neopia Central, Twin_Claire15165 (Claire) got seasick, and Zeldas_Star (Star) lost her purse. We spent nearly an hour scanning the entire boat before Star’s Puppyblew found it in an obvious place. Though the boat ride was hectic and long it didn’t stop us from having a whole lot of fun in Neopia Central. Claire insisted on visiting Uni’s Clothing and the Grooming Parlour, then Rokkelle dragged us all through the Bakery, the Chocolate Factory, and Fresh Smoothies for lunch. Star was overjoyed to go to Battle Magic and Defence Magic, and after that I was ready to cal it a day. Twilight had just fell, and no boats would sail at night. We were abandoned in Neopia Central! The Neolodge was just down the road, so we set off for a room. At the receptionist desk, I discovered I had less than one hundred neopoints! We had spent over two hundred thousand just shopping. What a horrible, horrible mistake... I thought to myself. After Rokkelle tripped over something, and I knocked over a candle (luckily the floor was just cement! ), Star, Rokkelle, Claire and I shabbily tried to sleep. It was pitch black, and oh, how the smell made my nose want to jump off my face! The next morning, I realized the only one who really slept was Claire’s Gruslen, Tiger. Upon checking out, we made our way off to Roo Island to catch a ride to Tyrannia. Except we had no money to pay the fare! How could I have forgotten AGAIN? Seeing the large crates waiting on the dock reminded me of movie scenes where characters hid in them and got a free ride somewhere. I used Claire’s barrette to pry off the top of a crate, and Star slipped in unseen. It was the next crate where someone noticed me. “HEY! What do you think you’re doing?” A red Yurble with a white hat featuring an image of an anchor, dressed in formal clothing came towards me. “Eh... umm... I was, uh...” I rambled. This wasn’t at all like the movies- I couldn’t find an excuse! “Run!” I mumbled to Claire and Rokkelle. We set off running to hide behind some colorful Roo Island buildings. The Yurble yelled something back at us while shaking his fist in the air, but we ran too fast to hear him. Behind the Souvenirs shop, while I panted heavily, Claire (who was a great runner, considering she was a Christmas Kougra) and Rokkelle devised a plan to distract the captain and get on the ship with Star. “Dusk will do this part.” Rokkelle glanced at me with a grin. “WHAT? Why me?” I challenged. “I’d rather stop the boat...” I grunted. “Wait! Wait, wait wait wait, WAIT!” I howled. Rokkelle and Claire went mute and locked eyes. After an extended silence Claire found a suggestion. “Do you want to get on the bat with Star or not?” Claire questioned. “Yes and- HOLY CHEESE, CLAIRE, ROKKELLE, THE BOAT IS LEAVING RIGHT THIS INSTANT!” I freaked. They were startled for a half second before we ran at the boat, flailing our arms uselessly about and hoping the boat would come to a halt. “YOU FORGOT SOMETHING!” Rokkelle shrieked. The boat promptly cut short of its route and turned around. “When I whistle, it’s safe to come to the dock,” Rokkelle explained to me. “Ok... ready... set... GET INTO YOUR POSITIONS, EVERYONE!” commanded Rokkelle. I darted for the store, narrowly missing a tree, and hid behind a bush. I pushed aside a few branches and peeped through the shrubbery. Rokkelle’s lips were in motion as she pointed towards the shop. A red neopet nodded and began towards me. Doing some fast thinking, I positioned myself on the ground in a crumpled position and began crying out for help. The red Yurble immediately ran to me and kneeled at my side. A crowd had suddenly compiled around me, and I was about to state the lie I had planned, about me taking a clumsy fall, when I was deafened by Rokkelle’s shrill whistle. Leaping onto my feet, and shoving through the crowd, I left the captain to look back at me and roar. Rokkelle and I had gotten on the boat ok, and Claire had discovered Star's position, though nobody knew how to navigate a boat. "Let's use this row boat- we can paddle our way home!" Claire exclaimed. We all jumped into the boat- all except for Star, who tripped over her dress and fell on top of Claire. The boat hazardously rocked. When the left side began to sink, everyone fumbled over the the right side. Then both sides began to submerge underwater... that is, until I found a life ring and got everyone out of the boat and onto the life ring. Somehow, the captain had navigated the boat off to its destination, so we were stuck in the middle of the ocean with nothing to keep us from drowning but a life ring. That’s when I realized Claire didn’t know how to swim. She tried to grab the life ring, but when she did there was a popping noise and all the air left the life ring. That’s when Claire went underwater. And didn’t come back up. Immediately reacting, I dove underwater and squinted around. The salt burned my eyes, but I didn’t care. Deeper and deeper I swam, my lungs slowly shrinking. Claire was still nowhere to be found. I almost began to swim back up, but I saw a familiar black shape. I followed Rokkelle’s finger, only to have water splashed into my eyes. I blinked, and used my free hand to rub the water out. Not far ahead was a fuzzy yellow island. When I cried the seawater out, I made out a yellow beach, and behind it, a dense, green jungle, which sat at the base of a giant orange plateau. “We’re home!” I cried out in delight as my feet hit sand. I helped haul Claire onto the beach, where she was mounted onto Star’s back. ...when I discovered my keys were lost. They weren’t in the contents of my soggy purse or my pockets. Since the doors and windows were locked, we would have to break a window. “But what about the chimney?” Star wondered. I went to the garden, picked up a stone, and smashed open a window. Everyone successfully made it in with no injuries. I set Claire out on the sofa, and put a bunch of blankets over her cold, wet body. Then I called Rokkelle and Star into the living room. “We can live off of the Money Tree!” Star suggested. “We could get jobs?” Rokkelle meekly said. Naomi then made her way through the exit. I turned back to the line at the Post Office, wishing it would move a little faster. Last week, when I began working the night shift at the hospital, I met Naomi. Luckily, she had known nothing of the little shenanigan that involved trying to break into a boat to avoid paying the fare, sinking a row boat, nearly drowning Claire, breaking my window, and losing every neopoint I owned. That’s when I saw a familiar red Yurble. Avoid eye contact, Dusk, avoid eye contact. He began to slow his pace as he made his way to the exit. Sweat rolled down the side of my head. My stomach clenched. There was so much saliva in my mouth I swallowed it all with a noisy gulp. Then the Yurble sped up and left the building. WHEW! I could relax now. Well, maybe. If he ever told The Neopets Team about my wrongdoings... well, it would be the end of me. I’d be kicked out of Neopia forever and I’d probably be sent to Virtupets Space Station to clean the Grundo Warehouse, or worse... clean up Moltara. Now THAT would be horrible! Once I was at the front of the line, I handed the receptionist my neomail and left. Since time was on my side, I hiked over to the Stock Market. FISH Stocks would never rise, ever. But as I looked at my portfolio, and saw FISH stocks had ruptured out of grey days and soared high. They were at almost five-hundred neopoints per stock! Hurriedly, I sold every single FISH stock- which was around three thousand of them. I was filthy rich! 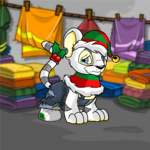 I danced around Neopia Central for a moment, and even donated several bags of one thousand neopoints to the Money Tree, before departing to find a boat en route to Tyrannia. But before I knew it, I found myself on a boat exiting Roo Island- with a very cross red Yurble locking gazes with me. “Look- I have some explaining to do. I ran out of neopoints and couldn’t pay the fare, so my neopets and I tried to sneak on the boat. I got Star into a crate, but you came and Claire, Rokkelle, and I fled. “We then devised a plan to sneak on, which technically worked. We ended up having to jump off the boat and Star tripped and we sank the boat, then Claire drowned and we swam miles back to Tyrannia and then I got back to my neohome and didn’t have my keys, so I broke a window to get in, then... well, I’m really sorry for the trouble. “Here- accept this as my apology.” I held out half my earnings from the stock market to him. His eyes magnified as he accepted the money. “Apology accepted.” He smiled at me. The boat had just arrived at Tyrannia, so I hopped off, and it felt like a giant weight had been lifted from my shoulders. Faeries had not always been enemies of Balthazar, however; in fact, the Lupe once wanted nothing more than to be a Faerie. Crokabeks circled overhead as Edna stood in her garden patch gazing upward with one paw shading her eyes from the hazy sun. Where did they all come from? she wondered.